IPL 2019: CSK went top of the table after they beat KKR by seven wickets. IPL 2019: MS Dhoni is probably the most popular Indian cricketer ever. He gets a rousing reception everywhere he goes and every appearance he makes. The 37-year-old legend got a king-like reception when Chennai Super Kings landed in Jaipur for their next IPL match. 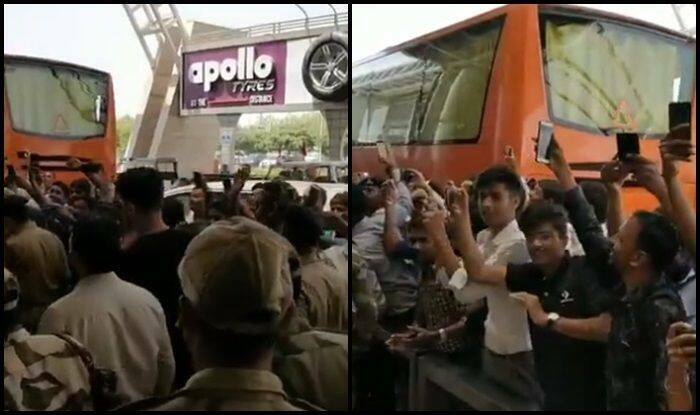 Fans went bonkers on getting a glimpse of their hero as they started chanting ‘Dhoni, Dhoni’. The Chennai Suoer Kings went top of the table after they beat KKR by seven wickets at Chepauk. Not long back, CSK posted a picture where the skipper could be seen taking a quick nap on the floor. “If you look it looks a good wicket to us. But, I don’t think we want to play on wickets like these because it becomes too low-scoring and it becomes slightly difficult for our batters to get going. And also what happens is that it’s slightly more difficult if you’re batting first. As the dew comes in, it becomes slightly easier in the second half,” ESPN Cricinfo quoted Dhoni as saying. Chennai seamer Deepak Chahar, who took three wickets in the match, too expressed displeasure over Chepauk track saying that nobody wants this type of wicket. Chennai will now visit Jaipur to face Rajasthan Royals on April 11.